MILPITAS, Calif.--(BUSINESS WIRE)--Jun. 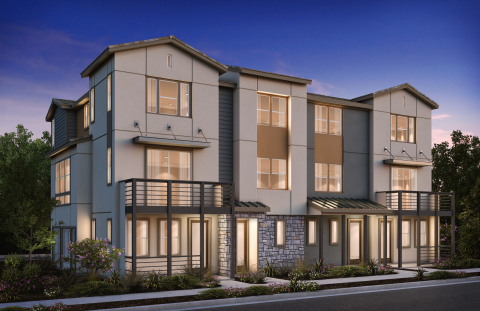 13, 2018-- KB Home (NYSE: KBH) today announced the model home debut at Circuit, a new home community of townhome-style condominiums in the heart of the Bay Area. Designed with the needs of today’s Silicon Valley buyer in mind, Circuit offers easy access throughout the Bay Area via Interstate 880 and is close to major employment centers. Golf enthusiasts can tee off at Summitpointe Golf Club, and nearby Mission Peak Regional Preserve and Sunol Regional Wilderness offer a plethora of outdoor recreation options, including hiking, biking, horseback riding, swimming, camping, and hang gliding. Circuit is also just a few miles away from Great Mall, Northern California’s largest indoor outlet mall featuring more than 200 retail stores. The three-story residences available at KB Home’s Circuit range in size from 1,218 to 2,035 square feet, and include up to three bedrooms, three-and-a-half baths, and attached garages. Open floor plans, walk-in closets, and generously sized kitchens are characteristic of all the homes at Circuit. Pricing begins from the mid-$900,000s. “With the limited inventory in the market, and strong demand for homes in the Bay Area, we are pleased to be providing new home opportunities in the highly desirable City of Milpitas,” said Chris Apostolopoulos, regional president of KB Home’s California operations. The KB homes offered at Circuit will be built to both ENERGY STAR® and Build It Green guidelines and include Watersense® labeled faucets and fixtures, meaning they are designed to be more energy- and water-efficient and can potentially save homebuyers money on their monthly utility bills, as compared to other typical new and resale homes in the area. The energy-saving features included in the KB homes at Circuit are estimated to save homeowners from $720 to $1,368 in annual energy costs, depending on the floor plan. As part of KB Home’s unique homebuying experience, buyers at Circuit will have the opportunity visit the KB Home Studio, where they can personalize many aspects of their new home to best fit their lifestyle and budget. The model home debut celebration at Circuit will take place on Saturday, June 16 from 10:00 a.m. to 6:00 p.m. From I-880 South, take Exit 10/Dixon Landing Road and turn left. Turn right on California Circle and the community will be on the left. For more information about Circuit or KB Home’s other new home neighborhoods in the Bay Area, visit www.kbhome.com or call 888-KB-HOMES.